May 28, 2013 - On Tuesday the wreckage of a Piper PA 34 aircraft that was providing a volunteer medical flight (Angel Flight NGF743) that crashed last week was raised from a pond in Ephratah, New York. Frank Amerosa a 64 year old retired truck driver who was suffering from brain cancer was on that flight and his body remains missing of the dead. On May 24, 2013, Frank and his wife Evelyn boarded an Angle Flight piloted by John Campbell, 70, of Stamford, Conn out of Hanscom Airport in Bedford, Mass for Griffins Intl Airport Rome, New York when the twin-engine aircraft went down just after 5 PM. The NTSB reported the fuselage was raised from the pond and will be taken for inspection along with other debris found in nearby fields to a facility in Delaware were it will be examined by crash investigators. 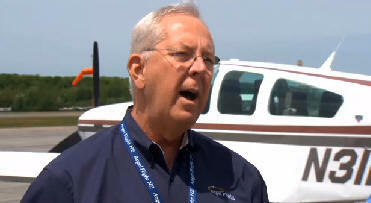 The NTSB further reported that prior to the crash the pilot did not issue a distress call. The bodies of the volunteer pilot for Angel Flight Northeast (AFNE) and Mr. Amerosa wife, 64 were recovered over the weekend. Fulton County Sheriff Department reported they will drain the pond and will scale back the search area to the crash site. Plane wreckage has been reported scattered over a large area with pieces of the plane found as far as five miles away. On Friday Angel Flight Northeast was notified at 5:45 PM by the Federal Aviation Administration (FAA) in Nashua, NH that the FAA had lost contact with an Angel Flight traveling from Bedford, MA to Rome, NY. At approximately 6:30 p.m., the Fulton County, NY Sheriff’s Department notified Angel Flight NE of a report of an aircraft down. AFNE confirmed that a flight was scheduled between Bedford, MA and Rome, NY with a pilot and two passengers on board. Fulton County authorities informed AFNE that two people were confirmed dead in the crash and the search for the third individual continues. Angel Flight Northeast is a not for profit organization that arranges free air transportation for patients with need who require access to medical care. Transportation is provided by volunteer pilots donate their time, planes and fuel. Since Angel Flight NE was founded in 1996, the organization has arranged free air transportation to medical care for more than 65,000 children and adults on approximately 60,000 flights covering a total of more than 12 million miles. The pilots daughter, Kimberly Conti said "John loved to fly and truly believed in the mission of Angel Flight. He loved volunteering his time and we take some solace in the fact he died doing something he loved while trying to help others." The 1978 Piper PA-34-200T aircraft, N31743 was owned by John Campbell. He was a multiengine commercial pilot with an instrument rating.